Push-ups make up about half of my chest (pectoralis) training, with the other half being bench press. While push-ups also benefit other muscles like triceps (back of the arm), deltoids (shoulders), abdominals (stomach) and latissimus (sides of your back) the chest is the most visible change. 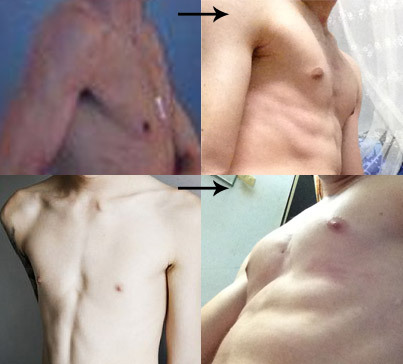 Personally I went from having visible ribs on my chest and almost no visible muscle, to having round and prominent chest muscles and visible muscle striations rather than ribs in about 6 months. I went from barely being able to do 3 pushups to being able to do 20 exercise band resisted push-ups. 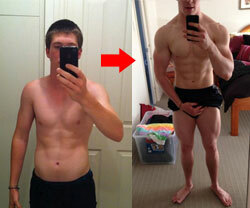 Here’s a before and after photo showing you 6 months progress. Sadly I don’t have good before photos, so I just used the most similar I could find on Google, that is honestly very similar to where I was though. I hope the difference is clear enough. For me it’s very clear in the mirror, going from nothing to something. Also people see me as more fit now since my chest fills up a shirt much better. If you can to 3 regular push-ups then collapse, the following would be a good plan. Day 1: Do 3-4 regular push-ups then immediately to as many knee push-ups as you can, nest have 1-2 minutes break. Repeat this process 3 times. You’re already finished after like 10 minutes. Now have 2 days break from push-ups so your muscles can recover and grow. Make sure to eat enough protein and calories in your break. Day 2: Do 4-5 regular push-ups then immediately to as many knee push-ups as you can, nest have 1-2 minutes break. Repeat this process 3 times. Your push-ups increased because your muscles have improved. If your push-ups didn’t increased, don’t worry, try again next training session. So with the breaks, you end up training 2-3 times per week, which is better than 7 times per week. Keep doing this until you can do 12-20 regular push-ups with a straight body and almost touching the ground, then you can optionally upgrade to exercise band resisted push-ups. Don’t expect miracles like big muscles in a week. 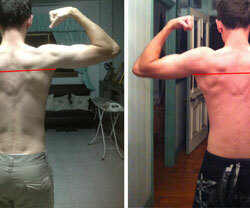 After 1 month you may notice small changes, and after 6 months you should see more significant changes like mine. Don’t forget to take a before photo, you’ll regret it later if you don’t. If you do only push-ups and no bench press, I expect you’d get 60-70% of the gains I got. If you can alternate between push-ups and bench press on training days, you should get similar results to me, or possibly more if you eat more. No Responses to "Do Push Ups Build Muscle?"